As we approach the 50th anniversary of the Space Age in 2007, and the 50th anniversary of NASA in 2008, it is appropriate to examine the effects of spaceflight on the larger society. Has the Space Age had an impact on society? If so, what are those influences? What do we mean by an "impact" on society? And what parts of society? 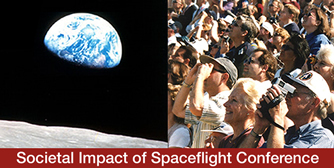 Conversely, has society had any effect on spaceflight? It is the contention of the organizers of this symposium that spaceflight has profoundly affected the society in which we live, and that society has affected the spaceflight enterprise through politics, funding, and a variety of other influences. But exactly how have those influences evolved and what do they signal about the history of the nation in the latter half of the twentieth century? The purpose of this conference is to examine these and related questions through scholarly research, making use especially of the tools of the historian and the broader social sciences and humanities. Since the dawn of spaceflight, advocates of an aggressive effort have argued that the movement of humanity beyond Earth made a significant difference in the lives of everyone, not just spacefarers but also those who were planetbound. Assertions abound about its ãimpactäon society and its relationship to the larger contours of human existence. This symposium asks a simple question that has many answers: what is the role of spaceflight in larger society? From this flow a series of additional questions ranging from how connections first emerged and how have they evolved since the 1950s to what are the major issues in the social history of spaceflight? Indeed, how can historians identify and interpret the effects of spaceflight on society? Examining historical ãturning pointsä may yield insights. The Soviet launch of Sputnik I and the ensuing U.S.-Soviet space race, space shuttle disasters and consequent reexaminations of spaceflight goals, and the twenty-first century entry of new members into an elite group of human space-faring nations, are among places to begin this examination. Exploring the influence of spaceflight on national and international political economy can illuminate effects on daily life and commerce. Analyzing how specific space applications have affected society ö the imaging of Earth from space, global space surveillance ö can reveal how such activities have affected not only commerce but also the environment, the nation, and the world. Case studies can look into how the space program has affected science, math, and engineering education; led to the creation of ãspace statesä such as California, Florida, and Texas; and changed the manner in which national security issues are understood and interpreted. Digging deeper, it is worth exploring how spaceflight has affected culture ö that ãhistorically transmitted pattern of meanings embedded in symbols · by means of which [people] communicate, perpetuate and develop their knowledge about and attitudes toward life,ä as anthropologist Clifford Geertz describes it. What is the interplay between spaceflight and those enduring American values of pioneering, progress, enterprise, and rugged individualism? How has spaceflight affected world views, conceptions of self and others, understanding of place and purpose in the universe? What does spaceflight mean? A thorough historical examination of the societal impact of spaceflight should highlight tangible and intangible returns on our national investment in space and add a beneficial, thought-provoking chapter to American history.